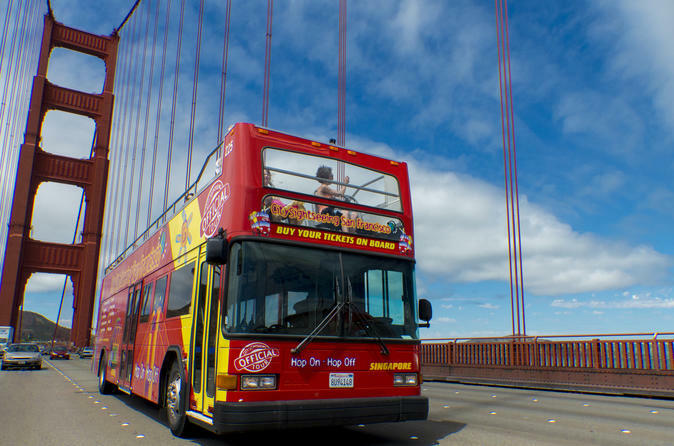 See San Francisco's most exciting attractions aboard a double-decker bus with one ticket! Choose a 1 day or 2 day City Sightseeing pass and discover downtown San Francisco, the Golden Gate Bridge, Golden Gate Park and other big-name attractions, all at your own pace. With a 1 day ticket, enjoy access to 2 routes - City & Sausalito - or with a 2 day ticket, enjoy access to 3 routes - City, Sausalito and Park & Beach - plus a wonderful night tour so you can enjoy evening panoramic views of the Bay (2 day only). This is a flexible, fun and family-friendly way to make the most of your time in the city! San Francisco offers so much to see in its 49-square miles: top museums, fantastic restaurants, theatre performances, one-of-a-kind architecture and panoramic views of San Francisco Bay. The best way to see your favourite sights at your own speed is with this City Sightseeing hop-on hop-off bus tour! Simply hop-off at the sights you want to explore the most, then when you're ready, hop back on! If you'd prefer, you can stay on the tour for a full loop as you enjoy the bus' tour commentary, giving you all the information you need about San Francisco's key sights. Choose a 1 day ticket and enjoy access to the City Tour and Sausalito Tour. Along these routes, admire sights such as Union Square – home to some of the cities most vibrant nightlife and shopping districts; Embarcadero – a wonderful waterfront boasting plenty of shops and eateries; the famous Golden Gate Bridge – arguably the cities most iconic and important landmark; Chinatown – the largest outside of Asia and Lombard Street – the most crooked street on earth! Admire the views of the bay along Fisherman's Wharf and Pier 39, or hop-off to enjoy the countless entertainment, attractions, shopping and eateries located here. Along the Sausalito Tour, embark on a once in a lifetime experience crossing the Golden Gate Bridge! Have your camera at the ready as you overlook San Francisco Bay and the beautiful town of Sausalito. With a 2-day ticket, enjoy access to the routes above plus a Park and Beach Tour & Night Tour. On the Night Tour, passengers will enjoy panoramic views of the city lit up beautifully of an evening. Along the Park and Beach Tour, hop-off to explore key points of interest including Lands End, Cliff House and the stunning Ocean Beach! There's so much to see and do, you will not be disappointed by this bus tour.